I saw this tutorial in Better Homes and Gardens on how to create a picture frame planter full of sedums. It's amazing. I want one. I want an entire fence made of them. I want an entire HOUSE made of them and then I'll marry them and have a million of their babies. 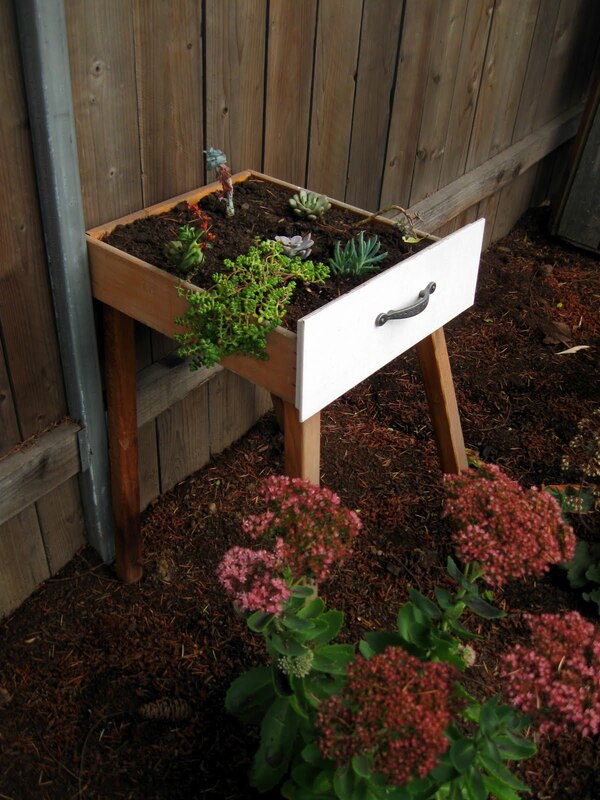 It made me miss my junky little bathroom drawer on stilts that I planted with sedums last summer, only to have it crushed when the gate fell down. All of a sudden it became imperative that I recreate it. I decided to check out Salvage Works in Kenton. They had lots of drawers that would have worked well but I got distracted by this rusted out wheelbarrow. Conveniently, it has a hole blasted through the bottom, meaning I could turn it into a planter with good drainage. I decided to sleep on it because I'm responsible. Also: I didn't have the keys to Greg's truck and it wouldn't fit in my Honda. I went back the next day and the owner had conveniently written the price on the handle in Sharpie. Except by "conveniently" I mean "stupidly." Anyone know how to get that off? I ran to Lowe's in search of sedums even though they never have good succulents. I should have gone to Portland Nursery or Cistus. Actually, I should have cleaned the bathroom or otherwise prepared for my sister's impending visit instead of messing around in the yard. Lowe's only had some unremarkable hen-and-chicks so I grabbed more grosso lavendar. I figure this probably won't last the winter above ground so I'll have to replant next spring. That's a little more unexpected, ya? I'm not sure how deeply it needs to be planted so I might have to go with something smaller. The wheelbarrow is only five inches deep. While I was garden shopping I bought some orange crocosmia for Greg (if baby wants orange plants, baby gets orange plants) and realized that this area of the yard is an even bigger mess than I thought. Because I never really planned this area, so many things need to be removed or moved. There's a mountain of wild morning glory quietly weaving around every plant in the area. I pull that weed every time I find it and it always comes back. My neighbor, the one who thinks I hate her Doug Fir, has it growing with abandon in her yard, meaning I will never be able to fully eradicate it. Ultimately I want to move the blueberry bushes from this area to the front yard, but that requires removed the rhododendrons, amending the soil, and doing a whole bunch of stuff for which I'm not ready. So they sit in the ground, planted far too closely to their replacement shrubs. Beautyberry sits right next to a flowering currant, which sits right next to an elderberry. They all suffer for it. I've also got a few plants on death row. Sadly, they are natives. This mock orange has been in the ground for two summers and has yet to flower. 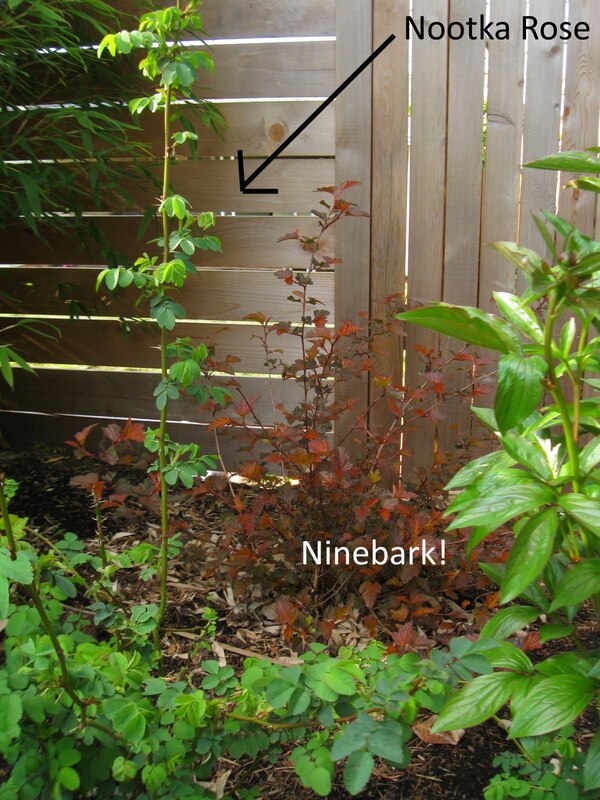 I have no place in my yard for shrubs that don't flower when their foliage is nothing to get excited about. I'm thinking about replacing it with a Mexican Orange, which is evergreen. This area desperately needs evergreen elements. I also want some goddamn flowers. Is that too much to ask? Also not flowering? The nootka roses. They've thicketed like crazy, popping up in places I never wanted and they have yet to produce a single flower. If I'm going to put up with thorns there had better be some flowers. I'm not running a charity over here. Also? 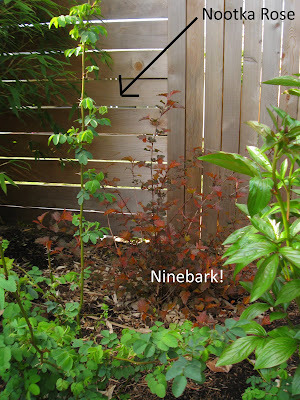 They've gotten so tall that I can't see the ninebark behind them. I'm thinking about removing them and planting something evergreen. Something chartreuse, maybe. Also on death row? Whatever critter broke my birdbath. AGAIN. I loved that drawer garden of yours! But I also love the idea of the wheelbarrow, and succulents seem like the perfect thing to grow in a wheelbarrow anyway. It's too bad we can't teleport, because my local Lowe's has a TON of succulents on clearance right now. Like, you could fill that wheelbarrow three times for under 20 bucks kind of clearance. Stupid present, where is the ST:TNG future you promised us? That agave is PERFECT for the wheelbarrow if the depth isn't too shallow. You are right about having something poke-y in there. I actually have a 'on hold' spot in my garden that developed not on purpose. I just didn't know where a few plants ought to go, but I didn't want them to die, so I plopped them behind our adirondack bench! Did you try Magic Eraser on the permanent marker? I haven't found anything that it hasn't removed yet. Good old Google also suggests in addition to Magic Eraser WD-40, Anti-bacterial hand gel, Hairspray, Cooking spray, Nail polish remover, Bleach (depending on the surface) and Goof Off. The wheelbarrow looks adorable in the yard! Guess what! Cistus has that very agave (the whale's tongue) not as big as Pam's but you could fill in with a few other smallish succulents. Have you ever been to their parking lot sale? It's coming up, happens every fall. Good stuff, a little "shop worn" for cheap! Really? I still haven't been to Cistus, I have NO idea why. I think this is going to be the perfect excuse to go out there.Thank you, Loree! I LOVE THAT WHEELBARROW. that is all. If you're wondering what a cenote is . . . I'm not sure why I was worried.